The Minxes have been in school for a little over a month, and we’re finally starting to settle into a routine. I’m always grateful to get those first few weeks under our belts because after a summer of late nights and lazy days, that back-to-school grind feels like a wallop in the teeth. I am happy to report that we survived Homecoming weekend without too much trauma (there was some, but nothing unmanageable) and that Miss M. doesn’t completely detest middle school. Those are two big wins in my book. One thing that never seems to settle down over here? Weekday mornings. Even when we pack the lunches the night before, make sure we’ve got clean clothes for the morning, check homework, get showers out of the way, set alarms accordingly…come morning, it’s still a scramble to get everyone fed and out the door for the day. It also doesn’t help that start times change and lunch schedules change, so we have to figure out a new game plan every year (if not every semester). Last year, Miss D. had lunch freakishly early (10:20) and Miss M. had it fairly late (12:40). Miss D. wasn’t that hungry at lunchtime but Miss M. was absolutely ravenous, so one kid got a modest lunch and the other got one built for a woodcutter. This year, it’s Miss D. who has the late shift–she has almost all of her classes before lunch. This means I have to really feed her well before I get her off to school; it’s well over 6 hours between when she gets up and eats the afternoon meal. That’s a long time! Sure, she’s a big girl and is perfectly capable of pouring a bowl of cereal in the morning, but I don’t think cereal’s gonna cut it. Fact is, I’m up anyways, since she can’t drive to school yet, so I might as well make her something that will stick to her ribs. And that means protein, folks. Preferably lots of protein and a balance of a little fat and some carbohydrates–that’s what nutritionists claim keeps us satiated the longest. Don’t be deluded into believing I’m going to whip her up an omelet with a side of bacon and home fries, though. Ummm…we’re still talking weekday mornings, here. I have two other mouths to feed and a dog and cat underfoot and dangit, someone needs something printed and is there any paper and where are my good jeans mom and Jesus, where are the car keys? We gotta be real. Breakfast needs to be good but it needs to be quick and easy. Many mornings, the answer is a yogurt/fruit smoothie and a whole-grain muffin. Sometimes, it’s a glass of Ovaltine and toast with peanut butter. Sometimes it’s a couple of slices of leftover pizza (Miss D.’s favorite). 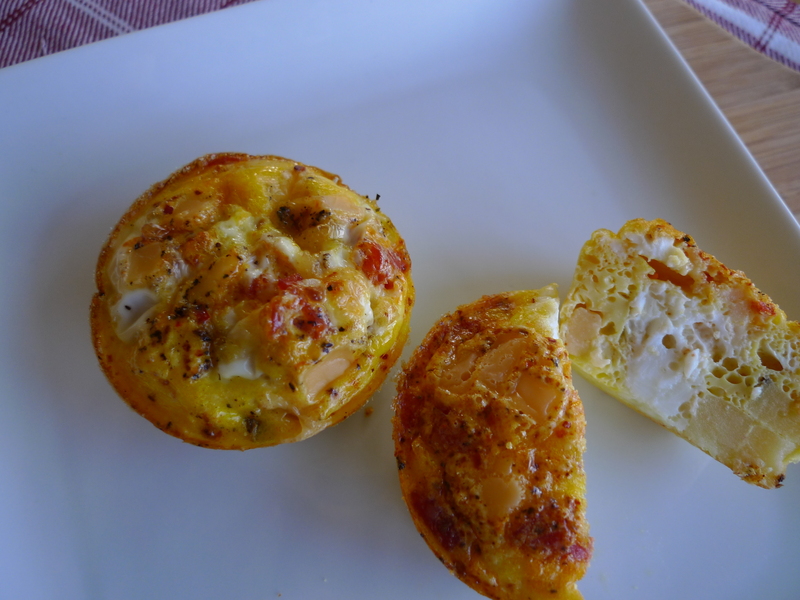 Sometimes, it’s these mini frittatas, which I love because I can make a batch over the weekend, keep them in the refrigerator and heat in the microwave as needed (heat gently–40% or 50% power at the most or else they get tough. No tough eggs, thanks!) I can throw leftover ham or turkey sausage in them, or whatever leftover veggies I have around. Little pieces of herbed cream cheese are genius in there because they make them extra rich. If I want them zingy, in goes some chopped jalapeno or salsa. I can heat a couple of these, pair with a piece of toast or some avocado and viola! Done. In a large bowl, whisk the eggs, milk, salt and pepper. Fold in the cheese of your choice. Whisk in any desired additions. Spray a 12-cup muffin tin with nonstick cooking spray. Place muffin tin on a cookie sheet. Using a ladle, fill muffin tins 2/3 of the way full. If desired, top with extra cheese. Bake for 20-25 minutes or until puffed and no longer jiggly in the center. 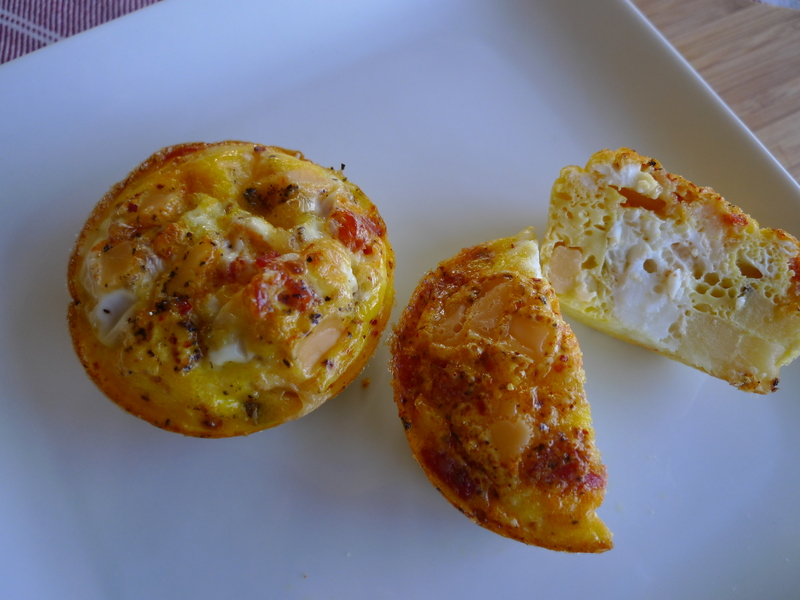 Frittatas will deflate a little when you take them out of the oven. Cool. Wrap in plastic wrap or small ziploc baggies and store in the refrigerator. To re-heat, microwave in 30-second intervals on NO more than 50% power. The cubes of seasoned cream cheese are genious! I’ve made versions of these several times but they end up with a rubbery texture once thawed and warmed that the girls aren’t crazy about. Adding in cream cheese bits would probably help that a lot!